Jumping into your car and discovering that the battery is flat can be extremely frustrating. However, thanks to the advancements in automotive technology, you can use a portable jump starter to get it up and running in minutes with ease. The best car jump starter is the NOCO Genius Boost Pro GB150 with a powerful 4,000 amps and capability of performing up to 80 jump starts from a single charge. Unlike using cables that require an additional car or a battery charger that takes times, the jump starter is instant and you can use it by yourself. They come in several different forms and many lithium ion jump starters are very powerful too. Lithium-ion jump starter devices are highly recommended as they are usually lightweight and much smaller. This means they can be stored inside glove boxes and do not need any maintenance compared to the lead-acid alternatives. However, opting for a lithium-ion example does usually come with a much larger price tag, which some people may not be willing to pay. However, there are many alternatives that are far cheaper and come with similar power outputs. Jump starters provide an efficient method of powering up a flat battery and have a range of other features. Below is a list of the best car jump starters that provide a large amount of power and cranking amps for dealing with a dead car battery. NOCO are the market leaders when it comes to jumper starter and charging equipment. The Boost Pro GB150 is an ultra safe lithium ion jumper starter that comes in a range of options that include 400 to 20,000 amps. There are many amperage options that NOCO offer this jumper starter in and for jump starting a battery, we recommend at least 1,000 amps. The best bang for a buck out of all the options is the 4,000 amps, which is suitable for 99% of all vehicles on the road (cars, trucks, SUVs etc). Overall, the NOCO Genuis Boost PRO GB150 is the best lithium ion jump starter with a large amount of features and power. It is expensive but the compact size, features, power and the one year warranty make it a worthwhile investment. If the NOCO Genius above is too pricey for your budget, the DBPOWER alternatives may be the better option. It is not as powerful but it is capable of powering up 6.5 liter gas and 5.2 liter diesel vehicles. It can do this up to 30 times per charge with a peak current of 600 amps. The clamps that you use to connect to the battery feature advanced safety and thicker cables to prevent short circuits, overload, over voltage protection and more. For a cheap jump starter, this is fairly impressive compared to similar price alternatives that feature just the basics. Overall, the DBPOWER is the best cheap jumper starter and even comes with three years warranty for peace of mind. Lithium ion jump starters are known for being pricey but the DBPOWER is far from that. Another affordable option that carries a large amount of power is the TrekPow car jump starter, which is suitable for 6.5 liter diesel or gasoline engines. Unlike many of the cheap alternatives, the Trekpow looks and feels high quality. Along with the impressive amperage of this lithium ion jump starter is the QSDP technology. This advanced functionality provides 3 to 5 times more jump starting current, which makes the process of jump starting a car far easier, especially within low temperature climates. Overall the TrekPow Lithium Ion Jump Starter is an excellent all-rounder that offers great value for money. The JNC660 is a portable car battery jump starter that is built with durability in mind. Examples of this can be seen with the heavy duty 46 inch 2 AWG cables that are copper insulated. This jump starter also doubles up as a charger too. Jump-N-Carry also provide the option of a lithium ion jump starter but compared against the NOCO genius above, it is not as good. The JNC660 is the far better option and although larger, it is still very portable with a handle located at the top. This car battery jump starter is more suited to garages or dealerships as its probably too big to store in most passenger cars. Overall, it is the best car battery charger and jump starter for the money that has been built to last. The heavy duty design also provides peace of mind and you just know that it will last many years to come. The Stanley Fatmax is an alternative to the Jump-N-Carry with a cheaper price tag. It comes with three power options that includes 600, 700 and 1,000 peak amps with the 700 and 1,000 Fatmax options including an 120 PSI air compressor. Stanley are a huge brand in the construction industry and this jump starter follows the same quality and durability. This large brand is the main reason why its so popular in the US and also provides peace of mind for yourself. Overall, it is the best jump starter with an air compressor and offers excellent value for the money. It is not as powerful as the alternatives but it has more than enough power to jump start the majority of car batteries. If you are looking for a cheap jumper starter for emergency situations and one that you can keep stored in your car, the Audew option is your answer. It is powerful, compact and more importantly cheap. Using this Audew lithium ion jump starter, you will be able to jump start gas engines to 8 liters and diesel engines to 7 liters. This covers the majority of passengers cars on the road and considering its a cheap devices, it performs very well. 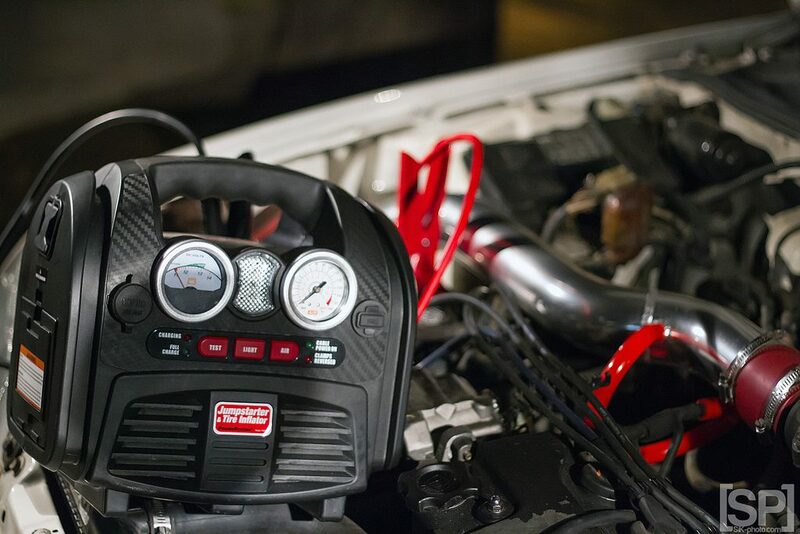 Overall, if you are looking for an affordable option that is reliable and has enough power to start your engine, then the Audew alternative is a great option. You can have the best car battery on the market but if you were to leave an electrical device on for long periods, it will eventually become flat. Once your battery becomes flat, you will not be able to start your vehicle without a “jump start”. 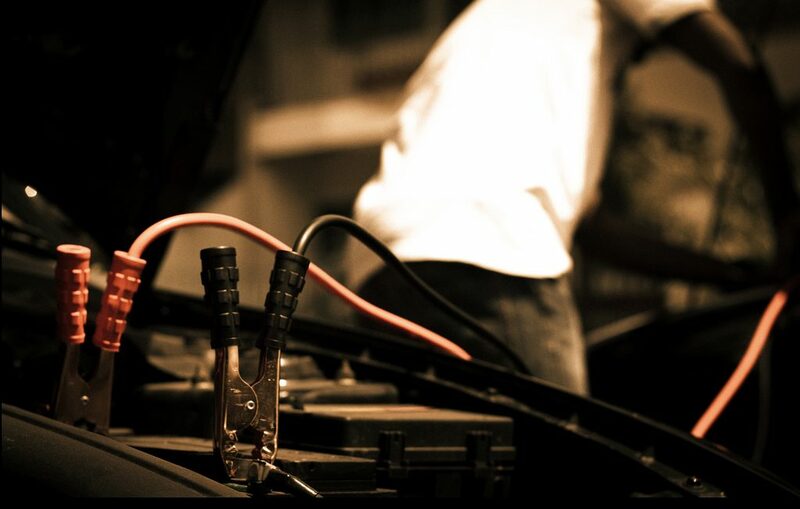 There are various methods of jump starting a car with many people owning a set of jumper cables, which will do the job. However, an alternative is a jump starter, which usually contains a power pack and a negative and positive battery connector. For flat batteries, you simply connect up the booster and turn it on. Your battery will now have a “boost” of power and should now be able to power up the car. The occasional jump start is great to get you up and running quickly but shouldn’t be used all the time. A low charged battery causes stress on the alternator and they are not cheap to replace when they break. To help you gain knowledge regarding the jump starter industry, we have compiled a detailed buying guide that features everything you need to know. The two metrics that you should look out are cranking power and peak power. The term cranking power refers to the amount of amps that can be delivered by the jump starter. Peak power is the maximum amount of power that the device can output. Around 1,000 amps is seen as very powerful and will be able to power up most vehicles so that they can start the engine. Of course, there are many manufacturers that produce huge power outputs. For those with large engines, you will want a higher amperage from the jump starter so that you can get enough electrical power to begin the process of starting the car. The crankshaft sensor and the ignition itself requires a large amount of electrical power. If you are using a jump starter that lacks power, you will be putting more stress on these components as they will have limited power to use. When it comes to the types of portable jumper starter devices available, there are two main options that include lead acid and lithium ion. Both are highly portable but the lithium ion jump starter is far more compact and lightweight. Although the lithium ion option is more expensive, they often come with far more power and can be easily stored inside the vehicle. Noco Genius dominate the market for these types of jump starters and are very popular worldwide. The lead acid alternatives offer more functionality but are slightly heavier. Many include an air compressor that can be used as a tire inflator. They are also far more durable than the lithium ion alternatives too, which is great for using within a garage. For those that travel for long periods, the lithium ion jump starters may be the best option. This is because you are able to store them in your glove box or anywhere in the car and use them to charge your personal belongings. To some, the extra features may make all the difference and its worth browsing each device to see what features are available. A reliable jump starter is a must because your flat battery has already let you down. Therefore, you will want to ensure you go for a trusted brand that are known for their jump starters and look out for long warranties and heavy duty design. Thicker wires, heavy duty design and sturdy clamps are all signs of a durable jump starter. Although, you do not want a really heavy device because this will ruin the point of a portable jump starter. However, its worth noting that with jumper cables, there is no need to check on the battery. This can be a drawback of a jump starter as the internal battery will require charging and this is something that can be easily forgotten. If you find yourself constantly jump starting your vehicle because your battery is flat, you really have to ask yourself whether its time to replace it. Clearly, if you find that you are constantly jump starting the battery, there is an underlying issue. Using a jumper starter is not necessary healthy to the cars battery but if you have no alternative, it is all you can do. If the battery is struggling to hold charge, it would be advised to replace it for a new battery. However, if you are only travelling small distances, the alternator does not have enough time to charge the battery. Therefore, we recommend that you invest into the best car battery charger and fully charge the battery. If you still find yourself having to jump start the battery, this would mean that there is a heavy electrical draw coming from the car or the battery needs replacing. Connect the positive jump starter cable to the positive terminal. Connect the negative jump starter cable to a ground location. Place the jump starter on an even and stable location. Switch the jump starter on. Disconnect the negative cable of the jump starter. Disconnect the positive cable of the jump starter. With regards to step 3, its important that you place it somewhere that is stable and does not move. Many people will place it on top of their engine and as you start to turn over the car, the engine moves. Find anywhere that is stable and suitable depending upon the location of your battery. Many modern vehicles nowadays are hybrids or electric and the use of a jump starter is not advised. We strongly recommend that you check the manuals of your vehicle before using a jump starter as it may not be safe to do so. If its an electric car, you should really be checking the charge before unhooking it from your ev charger. Below is a great video tutorial of using a portable jump starter for those that require additional information. A flat battery is very inconvenient and happens when you least expect it and it can leave you stranded for hours. All it takes is for a powerful electronic such as a touchscreen double din stereo to drain the battery within a short period. 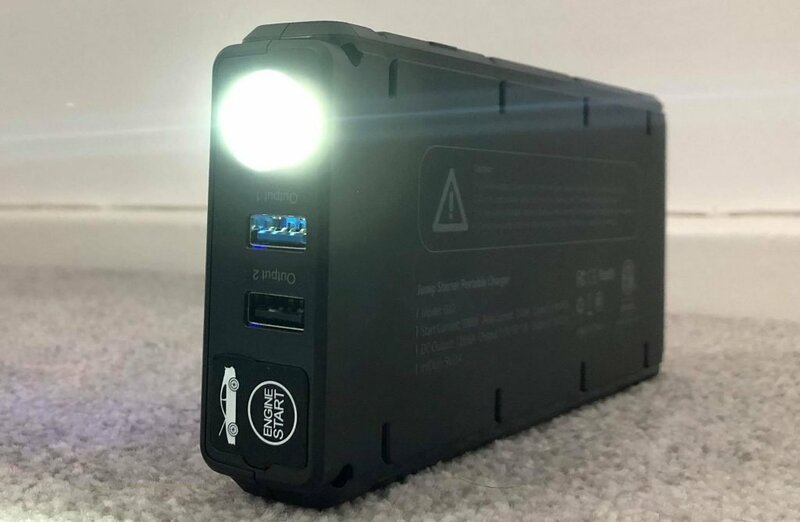 A portable jump starter can be one of the best things you ever buy that can power up a dead battery within a minute and be stored easily. For the average driver, the NOCO battery booster is the best buy as it is small and will power the majority of vehicle. The Jump-N-Carry JNC660 is more sturdy and is more suited for those that want to store it within their garage.